Bone giant-cell granuloma (GCG) is a non-neoplastic lesion. Hypoxia induces drug resistance in clinical tumors. The concept between drug resistance and apoptosis has been well defined but the relationship between reduced oxygen species and apoptosis is not a one-way story. Therefore, this study is an attempt to investigate the anti-apoptotic role of Bcl2 gene and Bcl2 protein in the hypoxia induced chemo-resistance of aggressive GCG. Forty cases of buffered formalin-fixed, paraffin embedded tissues of previously diagnosed cases of aggressive CGG were selected. Serial sections of 3 μm thickness were utilized for the detection of Bcl2 using t (14;18) (q32;q21) IGH/Bcl2 interphase Fluorescent in situ hybridization (FISH) and to assess the immunohistochemical expression of CAIX, MDR-1 and Bcl2. All studied cases were positive for CAIX and MDR-1 while they were negative for Bcl2 protein. FISH revealed normal Bcl2 gene with no cytogenetic aberrations among the studied cases. In the light of the findings of this study, we could conclude that hypoxia might play a role in the pathogenesis of aggressive GCG and could induce their chemo-resistance. Thus, tissue oxygenation could participate in the treatment of these lesions and might inhibit their expansion. Moreover, Bcl2 pathways haven't been implicated in aggressive GCG as Bcl2 gene is normal in all cases. Therefore, any treatment options based on the anti-apoptotic Bcl2 pathways for aggressive GCG must be avoided as they are ineffective. Giant-cell (GC) lesions form a group of clinicopathologic entities that differ in their behavior and may present substantial problems in differential diagnosis. Some are true neoplasms, whereas others represent a heterogeneous group of reparative or reactive reactions. The ubiquitous presence of multinucleated giant cells (MNGCs) in many unrelated lesions complicates their classification [1,2]. Clinical behavior and radiographical appearance of aggressive GCG are closely similar to that of giant cell tumor . Chemotherapy and irradiation affect only the cycling cells. Giant cells are arrested, and such treatment does not influence them. They become resistant to the applied drug or irradiation and can give rise to new cells possessing an inherited drug resistance. Moreover, giant cells could reenter the cell cycle, and this leads to multinucleation and polyploidization. Therefore, the number of giant cells increases, and they can survive in such state during further treatments, producing new cells or even reverting to the parental cell type which become resistant to chemotherapy . Lately, GC is termed neosis mother cell, undergoes karyokinesis via nuclear budding and can give rise up to 10 Raju cells/neosis mother cell. The Raju cell clones immediately start dividing via mitosis, may inherit aneuploidy, and display transient stem cell properties [5,6]. The human multidrug resistance protein (MRP) family contains at least six members: MRP-1, the godfather of the family and well known as the multidrug resistance protein, and five homologs, called MRP2-6 . Hypoxia induces drug resistance in clinical tumors, although the mechanism is not clearly elucidated . Carbonic anhydrase IX (CAIX), which is hypoxia inducible factor, is present in only few normal tissues. It is induced and overexpressed in a broad variety of cancers. It contributes to acidification of tumor environment by catalyzing the hydration of carbonic dioxide to bicarbonate ions and protons. This reaction has an impact on promoting cancer progression  and subsequent failure to respond to classic tumor therapy [10,11]. The concept between drug resistance and apoptosis has been well defined, by which drug resistance of chemotherapeutic agents is thought to be the result from inhibition of apoptosis. But the relationship between reduced oxygen species and apoptosis is not a one-way story [12,13]. Bcl2 proto-oncogene encodes an inner mitochondrial membrane protein that blocks programmed cell death (apoptosis) [14-16]. In future, it will be of importance to determine which molecular mechanisms are involved in giant cell formation and whether these mechanisms are reversible or whether they lead to cell death . This study is an attempt to investigate the anti-apoptotic role of Bcl2 gene and Bcl2 protein in the hypoxia induced chemo-resistance of aggressive CGCG. A total of 40 cases of buffered formalin-fixed, paraffin embedded tissues of previously diagnosed aggressive CGCG after exclusion of mimicker lesions as brown tumor of hyperthyroidism were selected from the archives of Oral Pathology Department, Faculty of Dentistry, Mansoura University, Egypt. Serial sections of 3 μm thickness were taken on silanised slides (S 4651, SIGMA DIAGNOSTICS, USA) for the detection of Bcl2 using t (14; 18) (q32; q21) IGH/Bcl2 interphase Fluorescent in situ hybridization (FISH) and to assess the immunohistochemical expression of MDR-1, CAIX and Bcl2. The sections were deparaffinized in xylene for 5 minutes, hydrated through graded alcohols for 3 minutes each and washed with Tris buffer saline (TBS). Endogenous peroxidase activity was blocked with 3% H2O2 in methanol for 10 minutes. The antigen retrieval was performed by heating the slides in a pressure cooker containing 10 ml citrate buffer (pH 6.0) solution for 5 minutes. The sections were incubated with the utilized primary antibodies against MDR-1 (Monoclonal mouse anti-human, with 1:50 working dilution, Bio-Genex, Emergo Europe, Molenstraat 15, NL-2513 BH The Hague, The Netherlands, CAIX (polyclonal rabbit anti-human at dilution 1:50, Catalog no. YPA 1250, clone P28, Biospes Co., Ltd) and anti-Bcl2 oncoprotein (Monoclonal mouse anti-human, clone 124, DAKO, CA, USA)], for 3 to 4 hours at 30 ℃ in a humidifying chamber. The subsequent procedures were done according to manufacturer's protocol. Immunoperoxidase method was performed using ImmunoPure Ultra-Sensitive ABC Peroxidase (catalog no. TL-060-PHJ, Thermo-scientific, UK), using diaminobenzidine as chromogen (catalog no. TA-125-HDX, Thermo-scientific, UK). All slides were counterstained with Gill's hematoxylin, dehydrated and coverslips mounted with Permount. Negative controls, carried out on consecutive tissue sections using either an isotype antibody (IgG1 and IgG2a, Coulter, Hialeah, FL, USA) or omission of the primary antibody, resulted in no detectable staining. The reaction products were visualized using 0.3% diaminobenzidine solution. The specificity of immunohistochemical staining was noted by replacing the primary antibody with TBS (negative control). MDR-1 and CAIX expressions were semi-quantitatively assessed for each case. The membranous as well as the cytoplasmic immune-reactivity were detected in lesional cells. The proportion of positively stained cells was estimated on a 4-point scale (¹, under 20%; ¹¹, 20-50%; ¹¹¹, 50-80%; ¹¹¹¹, more than 80%). Statistical analysis was performed by the Pearson's correlation test. The level of significance was significant at P value ≤ 0.05. Probes: Cytocell aquarius dual fusion probe for IGH/Bcl2 translocation (catalogue no. LPH018-Cambridge-UK) consists of a mixture of locus-specific fluorophore-labeled DNA probes containing sequences homologous to the IgH and Bcl2 genes. The IgH probe labeled in spectrum green includes nearly the entire IgH locus. The locus-specific Bcl2 probe labeled in spectrum red spans the entire Bcl2 gene sequence. Pretreatment protocol: The sections were de-waxed by placing slides in coplin jars of Xylene for 2 × 5 minutes. The slides were dehydrated in 100% Ethanol for 2 × 1 minute each. The slides were washed in distilled water (dH2O) for 2 minutes. Then the slides were cooked in the pressure cooker with 1 litre of dH2O for 3 minutes washed in cold tap water, followed by dH2O for 2 minutes. The sections were digested in a coplin jar with 0.1% Pepsin in 0.016N HCl at 37 ℃ for 10-20 minutes followed by wash in dH2O for 2 minutes. The slides were dehydrated through 70%, 85% and 100% Ethanol for 1 minute each. The slides were air dried in the oven or on a hotplate for 10 minutes at 40-50°. 8 μl of probe applied to the area of hybridization then coverslip applied, using 18 mm2 or 22 mm2 coverslips then sealed with rubber cement. Slides were then placed on slide hybridizer (Vysis hybrite, Garden Grove CA), lid closed and run program, which is set to 85 ℃ for 25 min, followed by 45 ℃ for up to 80 hours. After slide removal from hybridizer, rubber cement was removed and slides placed into 2 × SSC to remove coverslips. When all coverslips have been removed, slides washed in heated 0.4 × SSC/0.3% NP40 buffer for 2 minutes. The slides were transferred to a second jar of 2 × SSC/0.1% NP40 buffer at room temperature for 1 minute. Then to another coplin jar of 2 × SSC and wash for 2-5 minutes at room temperature. 1-2 drops of DAPI antifade stain were added then coverslip large enough to cover the hybridization area. Any air bubbles were removed by gentle tapping over the coverslip and the color was allowed to develop in the dark for 10 minutes. The edges of the coverslip were sealed with nail varnish and analyzed under a fluorescence microscope (Olympus BX61). Interpretation of FISH results: Representative images were captured using Cytovision software. Cases were defined as normal if there were two green (IgH) and two red (Bcl2) signals. Microscopically, multinucleated giant cells of the studied cases were arranged in focal aggregates around vascular channels or areas of hemorrhage (Figure 1A) or be scattered diffusely throughout the lesion (Figure 1B). Their stromal elements were vascular and rich in small, mononuclear spindle shaped cells having oval or fusiform nuclei (Figure 1A and Figure 1B). All MNGCs of the studied cases were stained positive for CAIX (Figure 2A) and for MDR-1 (Figure 2B). Meanwhile, the stromal cells were positive for CAIX (Figure 2A) and negative for MDR-1 (Figure 2B). Statistically, Pearson's correlation test revealed significant positive correlation between CAIX and MDR-1. Regarding Bcl2 protein, all studied cases were negative. FISH showed normal Bcl2 gene among all studied cases (Figure 3). In the present study, multinucleated giant cells were arranged in focal aggregates around vascular channels or areas of hemorrhage or be scattered diffusely throughout the lesion. The stroma was vascular and rich in mononuclear spindle shaped cells with oval or fusiform nuclei. This agrees with Anthony,  and Deepanshu Gulati, et al. 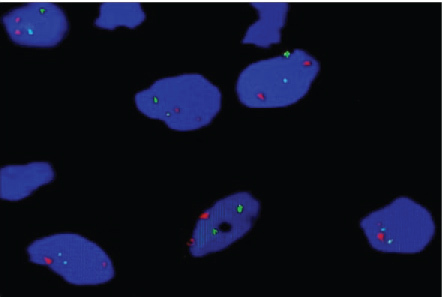 who observed the distinctive microscopical appearance of aggressive CGCG [18,19]. The focal aggregation of MNGCs around blood vessels or areas of hemorrhage could be interpreted by Atkins, et al. who reported an interesting finding of bone stromal cells due to local hemorrhage or trauma to the bone with resultant extravasation of these aberrant giant cells of bone into the blood vessels . In the present study, lesional cells (MNGCs and the stromal cells) were positive for CAIX. This is in agreement with Knowles and Athanasou, 2008 who demonstrated expression of hypoxia-inducible factor (HIF) in MNGCs and in the mononuclear stromal cells . Also, Muzylak, et al. , Arnett, et al. , and Hiraga, et al. found that hypoxia enhances differentiation of monocytes to osteoclasts and osteoclast like cells [22-24]. Furthermore, Wulling, et al. suggested that hypoxia and subsequent growth factor production within the bone microenvironment might contribute to the initiation and pathogenesis of giant cell tumor of bone . In addition, Knowles and Athanasou,  explained that hypoxic regulation of osteoclast formation and function, whether directly or via stroma-derived growth factors, could offer a wide-ranging mechanism propagating the osteolytic phenotype . Moreover, Broxmeyer, et al. and Lewis, et al. concluded that hypoxia stimulates the formation and activation of cells of the monocyte/macrophage lineage from which osteoclasts derive [26,27]. In the current study, MNGCs only were positive for MDR-1 while the stromal cells were negative. This could be supported by Wheatley,  who stated that chemotherapy affects only the cycling cells . Also, Pammer, et al. indicated that the proliferative ability of giant cell granulomas is restricted to the mononuclear cell compartment, whereas multinucleated giant cells lack mitotic activity . Moreover, Rostyslav Horbay and Rostyslav Stoika,  reported that giant cells can develop from either G1/G0-arrested or G2/M-arrested cells . Furthermore, studies have shown that spindle cells are the active cells in aggressive CGCG . In the current work, statistical analysis revealed significant positive correlation between CAIX and MDR-1. This is consistent with Wouters, et al. who reported that hypoxia is correlated with malignant progression and resistance to conventional chemo- and radio-therapies in many cancer types . In addition, Lynda, et al. found that the most important determining factor for development of resistance is the presence of hypoxia during the treatment period, not prior to treatment thus highlighting the potential importance of simultaneously reducing tumor hypoxia and treating with chemotherapy . In the same context, Selvendiran, et al. stated that hypoxia induces resistance to a wide range of cytotoxic agents in a number of different cancer types including ovarian cancer . Also, Comerford, et al. and Rohwer and Cramer,  mentioned that HIF-1 is able to activate the MDR-1 gene in response to hypoxia. They attributed this resistance to poor perfusion, which limits drug delivery and tumor penetration. Moreover, since chemotherapeutic agents target rapidly dividing cells, often they fail to target cells in hypoxic areas which are more slowly growing or non-proliferating [33,34]. Additionally, several researchers explained that hypoxia has been shown to induce platinum resistance through interference with a number of biological molecules such as L1-cell adhesion molecule (L1-CAM) , signal transducer and activator of transcription 3 (STAT3)  and p53 . Other reasons for chemoresistance of cells in hypoxic tumors include acidosis, nutrient starvation that inhibits cell proliferation and increased interstitial fluid pressure . Regarding Bcl2 protein among cases of the present study, all cases were negative and FISH showed normal Bcl2 gene. This is could be supported by Rostyslav Horbay and Rostyslav Stoika,  who demonstrated increased or decreased activity of pro- and anti-apoptotic proteins . They reported deficiency of p53 in giant cells. Also, Pammer, et al. reported that giant cells were negative to weakly positive for Bcl2 in peripheral giant cell granulomas and lesions containing osteoclast-like giant cells . Furthermore Christoph Wohlkönig,  showed that hypoxia-induced chemotherapy resistance was associated with down-regulation of the pro-apoptotic Bcl2-family-protein BAX . From the findings of the present study, we can conclude that hypoxia might play a role in the pathogenesis of aggressive CGCG and could induce their chemo-resistance. Thus, tissue oxygenation could participate in the treatment of these lesions and might inhibit their expansion. Moreover, Bcl2 pathways haven't been implicated in aggressive CGCG as Bcl2 gene is normal in all cases. Therefore, any treatment options based on the anti-apoptotic Bcl2 pathways for aggressive CGCG must be avoided because they are ineffective. O'connell JX, Wehrli BM, Nielsen GP, Rosenberg AE (2000) Giant cell tumors of soft tissue: A clinicopathologic study of 18 benign and malignant tumors. Am J Surg Pathol 24: 386-395. Povýšil C (2012) Giant-cell lesions of bone and their differential diagnosis. Cesk Patol 48: 141-145. Huvos AG (1987) Bone tumors: Diagnosis, treatment and prognosis. Wheatley D (2008) Growing evidence of the repopulation of regressed tumours by the division of giant cells. Cell Biol Int 32: 1029-1030. Rajaraman R, Guernsey DL, Rajaraman MM, Rajaraman SR (2006) Stem cells, senescence, neosis and self-renewal in cancer. Cancer Cell Int 6: 25. Sundaram M, Guernsey DL, Rajaraman MM, Rajaraman R (2004) Neosis: A novel type of cell division in cancer. Cancer Biol Ther 3: 207-218. Borst P, Evers R, Kool M, Wijnholds J (1999) The multidrug resistance protein family. Biochim Biophys Acta 1461: 347-357. Lara PC, Lloret M, Clavo B, Apolinario RM, Henríquez-Hernández LA, et al. (2009) Severe hypoxia induces chemo-resistance in clinical cervical tumors through MVP over-expression. Radiat Oncol 4: 29. Fang JS, Gillies RD, Gatenby RA (2008) Adaptation to hypoxia and acidosis in carcinogenesis and tumor progression. Semin Cancer Biol 18: 330-337. Supuran CT (2008) Carbonic anhydrases-an overview. Curr Pharm Des 14: 603-614. Winum JY, Rami M, Scozzafava A, Montero JL, Supuran C (2008) Carbonic anhydrase IX: A new druggable target for the design of antitumor agents. Med Res Rev 28: 445-463. Acharya A, Das I, Chandhok D, Saha T (2010) Redox regulation in cancer: A double-edged sword with therapeutic potential. Oxid Med Cell Longev 3: 23-34. Ivanova D, Bakalova R, Lazarova D, Gadjeva V, Zhelev Z (2013) The impact of reactive oxygen species on anticancer therapeutic strategies. Adv Clin Exp Med 22: 899-908. Tamaru Y, Miyawaki T, Iwai K, Tsuji T, Nibu R, et al. (1993) Absence of bcl-2 expression by activated CD45RO+ T lymphocytes in acute infectious mononucleosis supporting their susceptibility to programmed cell death. Blood 82: 521-527. Hockenbery D, Nuñez G, Milliman C, Schreiber RD, Korsmeyer SJ (1990) Bcl-2 is an inner mitochondrial membrane protein that blocks programmed cell death. Nature 348: 334-336. Korsmeyer SJ (1992) Bcl-2 initiates a new category of oncogenes: Regulators of cell death. Blood 80: 879-886. Horbay R, Stoika R (2011) Giant cell formation: The way to cell death or cell survival? Cent Eur J Biol 6: 675-684. Pogrel AM (2012) The diagnosis and management of giant cell lesions of the jaws. Ann Maxillofac Surg 2: 102-106. 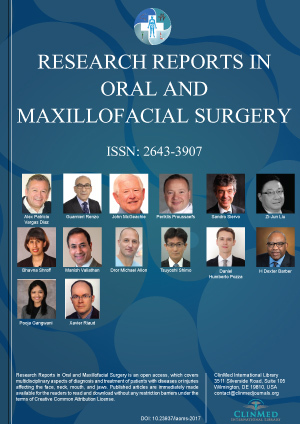 Gulati D, Bansal V, Dubey P, Pandey S, Agrawal A (2015) Central giant cell granuloma of posterior maxilla: First expression of primary hyperparathyroidism. Case Reports in Endocrinology. Atkins GJ, Haynes DR, Graves SE, Evdokiou A, Hay S, et al. (2000) Expression of osteoclast differentiation signals by stromal elements of giant cell tumors. J Bone Miner Res 15: 640-649. Knowles HJ, Athanasou NA (2008) Hypoxia‐inducible factor is expressed in giant cell tumour of bone and mediates paracrine effects of hypoxia on monocyte-osteoclast differentiation via induction of VEGF. J Pathol 215: 56-66. Muzylak M, Price JS, Horton MA (2006) Hypoxia induces giant osteoclast formation and extensive bone resorption in the cat. Calcif Tissue Int 79: 301-309. Arnett TR, Gibbons DC, Utting JC, Orriss IR, Hoebertz A, et al. (2003) Hypoxia is a major stimulator of osteoclast formation and bone resorption. J Cell Physicol 196: 2-8. Hiraga T, Kizaka-Kondoh S, Hirota K, Hiraoka M, Yoneda T (2007) Hypoxia and hypoxia-inducible factor-1 expression enhance osteolytic bone metastases of breast cancer. Cancer Res 67: 4157-4163. Wülling M, Engels C, Jesse N, Werner M, Delling G, et al. (2001)The nature of giant cell tumor of bone. J Cancer Res Clin Oncol 127: 467-474. Broxmeyer HE, Cooper S, Lu L, Miller ME, Langefeld CD, et al. (1990) Enhanced stimulation of human bone marrow macrophage colony formation in vitro by recombinant human macrophage colony-stimulating factor in agarose medium and at low oxygen tension. Blood 76: 323-329. Lewis J, Lee JA, Underwood JC, Harris A, Lewis CE (1999) Macrophage responses to hypoxia: Relevance to disease mechanisms. J Leukoc Biol 66: 889-900. Pammer J,Weninger W, Hulla H, Mazal P, Horvat R (1998) Expression of regulatory apoptotic proteins in peripheral giant cell granulomas and lesions containing osteoclast‐like giant cells. J Oral Pathol Med 27: 267-271. O'Mailey M, Pogrel MA, Stewart JC, Silva RG, Regezi JA (1997) Central giant cell granulomas of the jaws: Phenotype and proliferation‐associated markers. J Oral Pathol Med 26: 159-163. Wouters A, Pauwels B, Lardon F, Vermorken JB (2007)Review: Implications of in vitro research on the effect of radiotherapy and chemotherapy under hypoxic conditions. Oncologist 12: 690-712. McEvoy LM, O'Toole SA, Spillane CD, Martin CM, Gallagher MF, et al. (2015) Identifying novel hypoxia-associated markers of chemoresistance in ovarian cancer. BMC Cancer 15: 547. Selvendiran K, Bratasz A, Kuppusamy ML, Tazi MF, Rivera BK, et al. (2009) Hypoxia induces chemoresistance in ovarian cancer cells by activation of signal transducer and activator of transcription 3. Int J Cancer 125: 2198-2204. Comerford KM, Wallace TJ, Karhausen J, Louis NA, Montalto MC, et al. (2002) Hypoxia-inducible factor-1-dependent regulation of the multidrug resistance (MDR1) gene. Cancer Res 62:3387-3394. Rohwer N, Cramer T (2011) Hypoxia-mediated drug resistance: Novel insights on the functional interaction of HIFs and cell death pathways. Drug Resis Updat 14: 191-201. Stoeck A, Gast D, Sanderson MP, Issa Y, Gutwein P, et al. (2007) L1-CAM in a membrane-bound or soluble form augments protection from apoptosis in ovarian carcinoma cells. Gynecol Oncol 104: 461-469. Graeber TG, Osmanian C, Jacks T, Housman DE, Koch CJ, et al. (1996) Hypoxia-mediated selection of cells with diminished apoptotic potential in solid tumours. Nature 379: 88-91. Wohlkönig C (2012) Mechanisms of hypoxia-induced chemoresistance: Role of IAP family members and VEGF. Medizinische Universität. Mohamed I Mourad, Assistant Prof. of Oral Pathology, Department of Oral and Maxillofacial Pathology, Faculty of Dentistry, Mansoura University, 35516 El-Gomhoria Street, Egypt. © 2018 Mourad MI, et al. This is an open-access article distributed under the terms of the Creative Commons Attribution License, which permits unrestricted use, distribution, and reproduction in any medium, provided the original author and source are credited.